This book focuses on both construction and development issues, and examines how we can transition to a sustainable future by the year 2050—bringing together leading research and practice at building, neighbourhood, and city levels. It deftly analyses how emerging socio-economic, technological, and environmental trends will influence the built environment of the future. The book covers a broad spectrum of interests across the scales of buildings, communities and cities, including how professional practice will need to adapt to these trends. The broader context is provided by an analysis of emergent business models and the changing requirements for expert advice from clients. 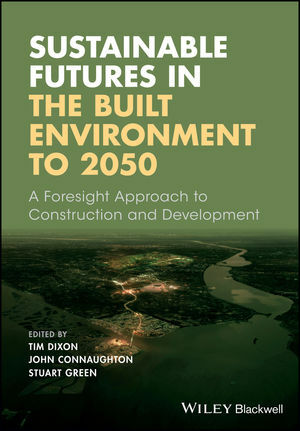 Sustainable Futures in the Built Environment to 2050: A Foresight Approach to Construction and Development is an important book for postgraduate students and researchers, construction, real estate and property development specialists, engineers, planners, architects, foresight and futures studies specialists, and anyone involved in sustainable buildings. Tim Dixon is Professor of Sustainable Futures in the Built Environment, School of the Built Environment at the University of Reading, UK. John Connaughton is Professor of Sustainable Construction and Head of Construction Management and Engineering, School of the Built Environment at the University of Reading, UK. Stuart Green is Professor of Construction Management, School of the Built Environment at the University of Reading, UK.